I have to say that, copying Thackaray for the millionth time, probably. What a difference to read the original, compared to the watered-down versions I was familiar with from my childhood. It took me quite a lot of time to get into the rich flow of words, the beautiful allusions, and the dry humour, but then I was hooked. My family will always remember the Christmas vacation when I was in a rage against Uriah Heep, not able to contain my anger, sharing my frustration loudly! But it wasn't only annoyance with the blatant hypocrisy, vulgarity and opportunism, of course. I fell in love with the minor characters, as I usually do when reading Dickens. And just following their paths, walking through 19th century London, is a delight! My eldest son finished it as well now, and interestingly he was more annoyed with David's naivety than with Uriah's hypocrisy and criminal activities. By now fully acquainted with the Copperfield universe, he read a comment in The Economist, and burst out laughing at the notoriously self-promoting, self-indulgent, deceptive politician of our days, who claimed to be "very humble indeed - people wouldn't believe really how humble I am!" "Is 'e as 'umble as Uriah?" my son asked, laughing tears. Well, Uriah ended up playing his tricks in prison... The 'umble scoundrel cited in The Economist later moved into the Bleak House, eh ... sorry, 'umble mistake, Black House it is. Wrong again? Well, in a world turned upside down, it is a pure pleasure to read Dickens and to know that his characters get the fate they deserve, and that poetical justice will come, after a long nail-biting adventure, originally delivered in the newspapers just like global day-to-day politics! So, Uriah! I would appreciate if you could just 'umbly stay a fictional character! Oh, Jean-Paul! You are in for a treat. Start with A Tale of Two Cities, or Great Expectations, or Hard Times .... uh? ... Pick one blindly and enjoy! Lisa - every time I see Donald Trump, I'll think of Uriah Heep now! Fionnuala wrote: "Lisa - every time I see Donald Trump, I'll think of Uriah Heep now! Jean-Paul - Bleak House ;-)"
Hehehe, Fionnuala, can you believe that Uriah Heep changed shape in my head after my son showed me that very 'umble statement. 'E 'as an interesting 'air cut now, 'as 'e not, that Uriah? This is a wonderful review Lisa. I had a professor in college who read something by Dickens over every Christmas break. It is a wonderful custom and one I've embraced as an adult. Kenny wrote: "This is a wonderful review Lisa. I had a professor in college who read something by Dickens over every Christmas break. It is a wonderful custom and one I've embraced as an adult." Thank you Kenny! I agree - Dickens is for slow reading time. Bleak House is my companion at the moment, but I haven't got very far yet. Jean-Paul wrote: "@Fionnuala: just added Bleak House to my list, but you know what that implies don't you Fionnuala :-) ." I'm glad to hear you've added Bleak House, Jean-Paul - I have an almost inexplicable fondness for that book. I remember that in our last discussion of Dickens, I warned you that some of his female characters can be more pitiful than powerful, I've been asking myself if that problem occurs in BH. I don't think it does - in fact the main female characters are quietly strong women, but my favourite, Miss Flyte (actually a minor character) although terribly fragile and feeble, is brilliantly drawn. I love Dickens' minor characters. Great anecdote about your son and the 'umble politician! Steve wrote: "Great anecdote about your son and the 'umble politician!" Thank you, Steve! It has become a saying between me and my son: "Is 'e really being that 'umble again?" Never fails to make us laugh! I've enjoyed two books by Dickens most- Great Expectations and David Copperfield- however in general I don't enjoy his works much, I love his character development and his wit/ irony he infused in his characters but somehow I don't get that awesome feeling while reading / after finishing his books (except for those two books), perhaps I like authors like Woolf, Beckett, Proust more probably because their works are about exploration of human psychology, more about thoughts/ philosophical enquiry/ feelings of characters rather than settings/ surroundings or their development (in that regard I enjoy Beckett most of all, I felt truly astounded by his Molloy, Malone Dies and The Unnamable trilogy- the monologues in The Unnamable absolutely blew me away and same feeling I got while reading To the Lighthouse). I have this Dickens on the short list and loved my recent read of Great Expectations. I hope to read something of his way year, along with Mr Trollope. The image of DT humbly pulling on his orange forelock would make me laugh if he weren't so depressing. 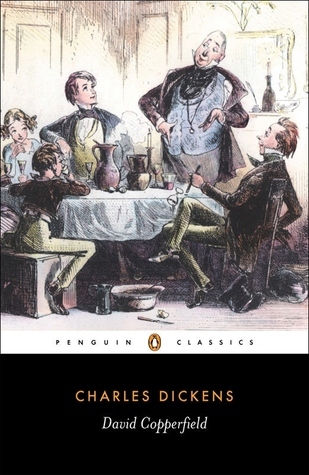 Sue wrote: "I have this Dickens on the short list and loved my recent read of Great Expectations. I hope to read something of his way year, along with Mr Trollope. The image of DT humbly pulling on his orange ..."
Jasmine wrote: "Lovely review, Lisa. I always read my Dickens books during the Christmas holidays :)"
Then we share a very nice custom, Jasmine! Well then I am glad that I acquired a beautiful paperback of David Copperfield and will be reading it late this year. Abubakar wrote: "Well then I am glad that I acquired a beautiful paperback of David Copperfield and will be reading it late this year." Can't wait to follow your experience, Abubakar! Me too, Helen, me too! Lada wrote: "Great. And good laffection for Dickens Unforgettable charaxters"
Indeed, Lada! Nothing like them! My favorite Dickens, read it years before joining GR so I can't write a proper review. Glad you wrote one and even shared it with your son. Awesome parenting! Apatt wrote: "My favorite Dickens, read it years before joining GR so I can't write a proper review. Glad you wrote one and even shared it with your son. Awesome parenting!" Bravo, Lisa, I have to say! I love Dickens and this is as good a book as any. It's hard to pick a favourite Dickens, but mine would have to be either Pickwick or David Copperfield (I want to pick both!) Sooo many wonderful characters in David Copperfield--Betsy Trotwood and those donkeys! I would love to visit her in real life just to hear her talk. "Barkis is willin.'" Mister Micawber, who has to be the ultimate proof that you can't keep a good man down. I think I may love Dan Peggotty best for the way he loves his niece and takes care of her no matter what his broken heart and the social norms of the day dictate. And yes, Uriah Heep, that wonderfully slimy little bundle of grasping humility. I can see where you would draw that modern comparison! For our country's sake I pray that our vision is wrong. Christie wrote: "It's hard to pick a favourite Dickens, but mine would have to be either Pickwick or David Copperfield (I want to pick both!) Sooo many wonderful characters in David Copperfield--Betsy Trotwood and ..."
Kevin wrote: "Bravo, Lisa, I have to say! I love Dickens and this is as good a book as any." Thanks, Kevin! There is no one like Dickens! Bravo for your Dickens' tour, Lisa! He doesn't disappoint and neither do your reviews! Dolors wrote: "Bravo for your Dickens' tour, Lisa! He doesn't disappoint and neither do your reviews!" Thanks, Dolors! As opposed to Dickens himself, though, I don'y consider David Copperfield the favourite. Even though I believe Uriah Heep is my favourite Dickens villain. My favourite Dickens novel, Lisa. Right after all my other favourite Dickens novels. Can never really decide. I just know every time I pick up one of his novels, it feels like going home, to a very comfortable place. Julie wrote: "My favourite Dickens novel, Lisa. Right after all my other favourite Dickens novels. Can never really decide. I just know every time I pick up one of his novels, it feels like going home, to a very..."
Yes, that is precisely it, Julie! Reading Dickens is like going home. And I also find myself preferring my latest Dickens, which happens not to be David Copperfield at the moment. My next one will be Our Mutual Friend, to honour our mutual feeling of comfort in Dickens, Julie!